Swirling with, pecans, cinnamon, butter and maple syrup, this decadent creation puffs up like a soufflé in the oven. You and your guests will be inspired to linger over a leisurely morning table with a second mimosa. We recently baked a loaf of twisted cinnamon bread, which is never better than on the morning it comes out of the oven. Since our Arctic kitchen is quite arid, items left out tend to dry out quickly, which gives us the opportunity to get creative with leftovers. Overnight French toast is not a new recipe for us. But starting with a base of this wonderful twisted cinnamon bread was new. Soaking the bread overnight in an egg and cream mixture causes the bread to puff up magically during baking. 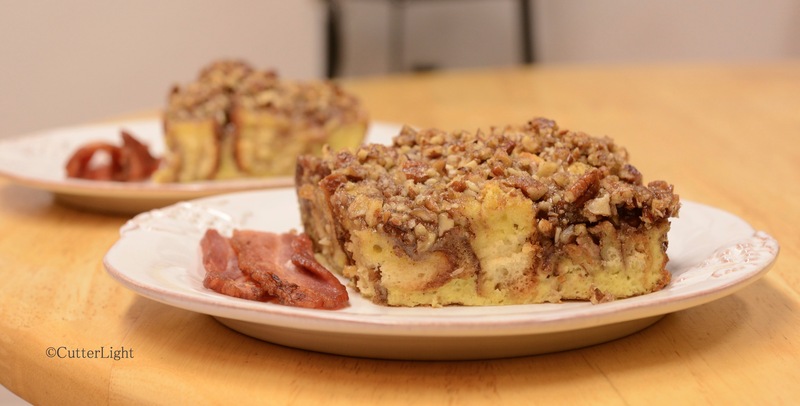 Drizzled with maple syrup and served with a strip of thick bacon this cinnamon loaf French toast was a great way to start a weekend! Butter an 8 x 8 inch glass baking dish. Lay slices of bread on bottom of glass baking dish. Bring bread mixture out of refrigerator and set on counter to come toward room temperature while preheating oven to 350 degrees F.
Bake for 20 minutes then top with pecan mixture. Continue baking another 20 minutes, until golden and puffed. 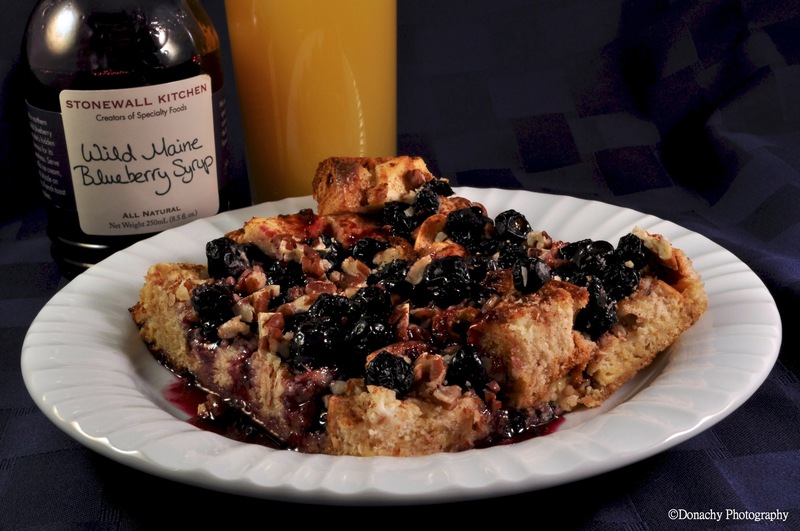 Blueberry French toast made from leftover challah bread makes for a gourmet breakfast. Thick slices of apple-smoked bacon and freshly brewed cups of espresso roast coffee rounded out this Spring Break breakfast. Spread cream cheese on top of bread slices. Cut slices into 1-inch cubes. Arrange the bread cubes in the dish. Sprinkle with 1 cup blueberries. In a large bowl, mix the eggs, milk, cream, vanilla extract, and syrup. Pour over the bread cubes. Cover, and refrigerate overnight. I opted to sprinkle chopped pecans onto the French toast during the last 10 minutes of baking. The French toast is not overly sweet, which is what I was going for. You could mix in confectioner’s sugar with the cream cheese for a sweeter version. Cinnamon would also be a nice addition.